What format are Orange Sim cards? 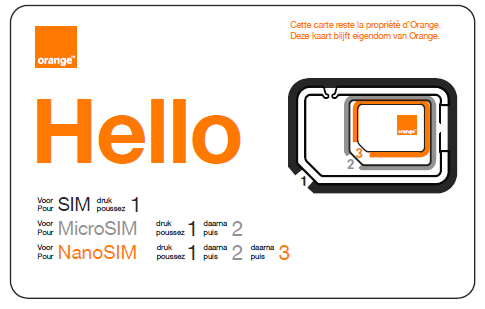 Orange automatically sends out multi-format SIM cards. This card intelligently contains all SIM card formats. Simply select the format you need. If you accidentally press out the wrong piece, don't worry, the other pieces can be used as an "adapter". Just take out the section you need and insert it into your device. Micro-SIM is used for the iPhone 4, iPad and most smartphones. Nano-SIM is used for iPhone 5, iPhone 6, iPad mini, iPad Air and iPad Pro. Do you need a new SIM card? You can order a new SIM card online via your Customer Zone. Go to ‘device’ tab in the Customer Zone and in just a few clicks you can order your new SIM card which should arrive in the post within 2 working days. You can then activate it online in the Customer Zone. This service is entirely free of charge. You can also go to any Orange Shop to get yourself a new multi-format SIM card. This will be activated within a few hours so you can get your device up and running as quickly as possible. Don't forget to save your contacts when you change your SIM card. Any contacts which are saved to your current SIM card will not be transferred to your new card.